Team Suzuki Press Office – March 30. Rockstar Energy Suzuki World MXGP’s Clement Desalle claimed his first chequered flag of the season and tied on points for overall victory on his factory RM-Z450 in front of 30,000 excited spectators for the first Grand Prix of Argentina in 20 years. The third round of 18 in the FIM Motocross World Championship took place today in the depths of the Neuquen region, Patagonia and to an eager audience drawn from the country and nearby neighbouring Chile. A brand new circuit, a short distance outside of the town of Villa La Angostura, provided a fast and tricky proposition. The fine and sandy consistency of the soil was bumpy in places but the hard base of the surface posed problems for traction. Some riders opted for conventional tyre tread while others selected a sand ‘scoop’ profile for better grip. 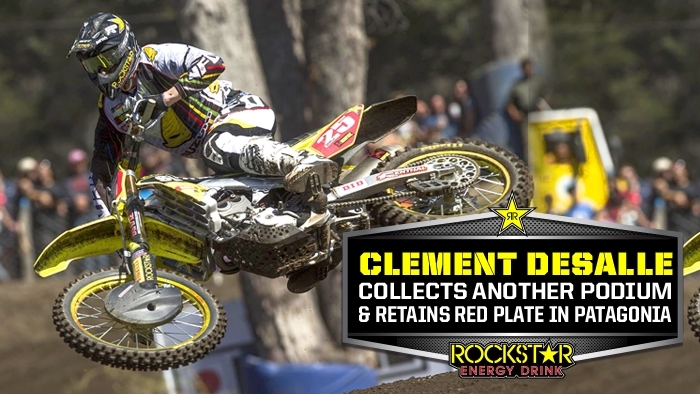 Desalle, MXGP series leader coming into the weekend and therefore running red number plates on the RM-Z, was one that varied with the Pirelli options. The Belgian clocked the fastest lap in Timed Practice on Saturday and after a mistake in the Qualification Heat managed fourth place for the start gate on Sunday. The two 30 minutes and two-lap motos took place in cooler and cloudier conditions. In the first sprint, Desalle was perfect and led from the exit of the first corner until the chequered flag. He weathered some late pressure from Antonio Cairoli and didn't make any mistakes until the finish. The second race seemed to be heading in the same direction as Desalle led the first six laps but his speed was no match for Max Nagl and then Cairoli on this occasion. A couple of errors reduced his chances of re-passing the World Champion and he classified third. With a 1-3 score, ‘#25’ totalled the same points as Nagl, but the German walked the top-step courtesy of the second moto ranking. Thanks to a third consecutive podium finish and a streak of six results where his worst finish has been a third place, Desalle continues his hot spell of form and has a 10-point advantage at the top of the MXGP standings. Team-mate Kevin Strijbos missed the Grand Prix after surgery on his right wrist last Wednesday. The Belgian is hoping to be back for round four in three weeks. The Grand Prix of Trentino, taking place for the third successive year at the compact Arco di Trento circuit, will happen on April 19th.